The Google Pixel 3 and Pixel 3 XL’s presumed October 4 announcement is still a fair bit away but, thanks to new rumors, we’re getting an almost complete picture of the handset’s looks and specs. The Google Pixel 3 XL has been basically photographed in full, complete with the deepest screen notch yet, by Russian tech blogger Канал Лучкова. There’s also an image of the back of the white smartphone, revealing a virtually unchanged two-toned glass and aluminum design compared to the current Pixel 2 XL. 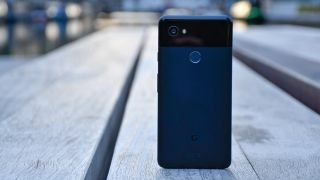 Likewise, it seems as if the Google Pixel 3 XL will still feature only one rear camera. Unfortunately, the photos are too dark to discern if the front of the phone includes dual selfie-cams. The photos also seem to breakdown the full retail packaging, which appears to include a pair of wired USB-C Pixel Buds in the box. We also get a shot of the device information listing the Google Pixel 3 XL specs include an octa-core Qualcomm processor – which we assume to be the Snapdragon 845 – Ardreno 630 GPU, 1,440 x 2,960 screen resolution and 4GB of memory. These Google Pixel 3 XL specs match up perfectly to those taken from a leaked benchmark PlayFulDroid (seen below), which all but confirmed an Snapdragon 845 processor on top of the same screen resolution and memory capacity. This is making the wait until October 4 particularly brutal.